The Game of Thrones world can be darker than Ramsey Bolton’s mind and more twisted than Cersei Lannister’s soul. Thank the gods then, that the scenery is so utterly beautiful. But remember: landscapes like this can only be found in Northern Ireland. This four-day itinerary brings you right into the bloody heart of the Seven Kingdoms. Along the route, we’ll pass through the most memorable locations from the show, where the wicked Lannisters, honourable Starks and all the rest play out their parts. So sharpen your sword, tighten your shield-strap and set forth on a journey into the real world Westeros. This is a sample itinerary, and should be used as a guide only. If you have any suggestions for future itineraries, we’d love to hear from you. Your quest begins at the foothills of the western Mourne Mountains, at Leitrum Lodge in County Down. This green little slice of heaven sets the scene for Sansa and Littlefinger’s journey towards the Eyrie, while Brienne and Pod watch from a distance. 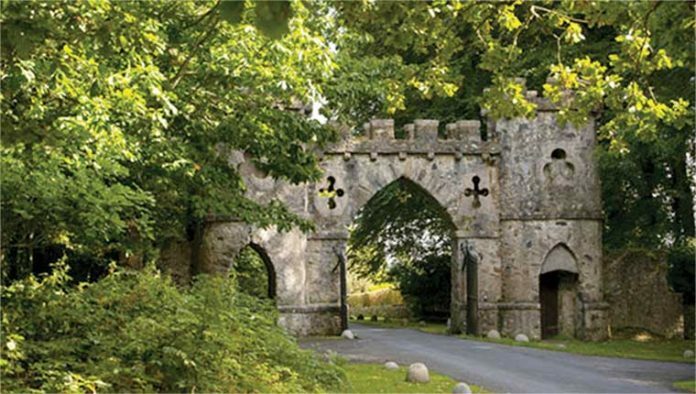 After that, take a trip into Tollymore Forest Park in County Down. Just a beautiful park? Far from it. How could we forget the scene with the three Night’s Watch men riding into the Haunted Forest and falling foul of a dreaded White Walker? The same forbidding setting also witnessed Theon’s failed escape attempt, and subsequent capture, by the vile Ramsay Snow, not to mention Bran Stark’s eventual meeting with the mysterious three-eyed raven that plagued his dreams. Of course, like all things in Game of Thrones, this bird is not what he seems. 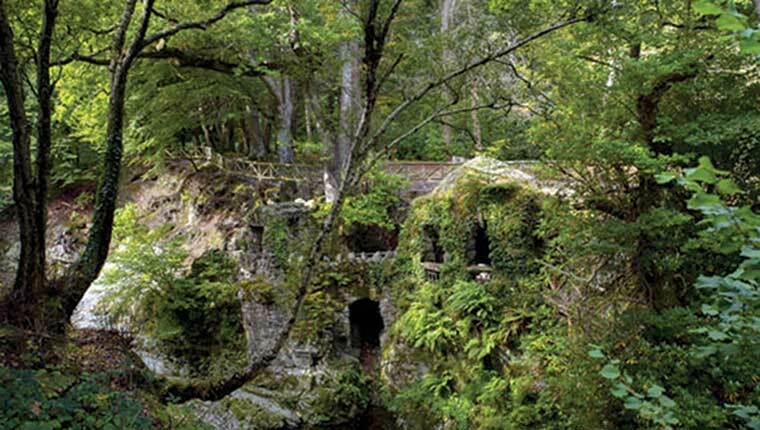 With plenty of rich woodland, hidden caves and gothic-style bridges and gates, Tollymore is an appropriately dramatic start to your Westeros adventure. 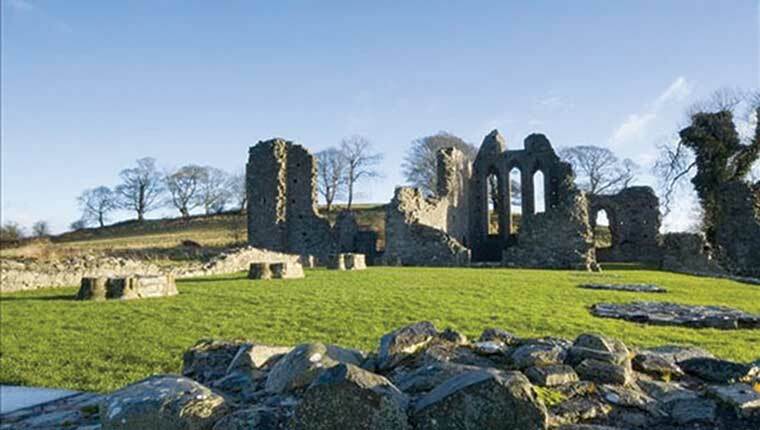 But the fantastical fun doesn’t stop – next is 800-year old Inch Abbey, to the north east, the location of some of the show’s most compelling moments. It was here that Catelyn Stark heard of Ned’s death, where Jaime was captured and Robb crowned king. The Quoile River was used to depict the Riverlands area – home of the Tullys – and the Red Fork. It’s also the Old Valyria Canal in Essos, where Jorah and Tyrian set sail to Meereen, after Jorah steals a boat and takes Tyrion captive. Inch Abbey’s surrounds, too, were used to shoot Hoster Tully’s funeral. In the same neck of the woods, Arya and the Hound’s uneasy relationship kept us spellbound as they navigated the rugged landscape to reach the Red Fork. Of course, the 12th century ruins of Inch Abbey make for a fascinating visit despite all the fantastical bloodshed. Next, we creep west and to the shores of Strangford Lough. Castle Ward in County Down was used to depict the home of House Stark: Winterfell. This 18th century National Trust property was transformed for the scene when Robert Baratheon and his court arrive in Winterfell. It’s also where Robb Stark’s army was forced to make camp enroute to The Twins. An epic spot? We wouldn’t lie…. With both classical and gothic architecture inside and out, Castle Ward makes for a perfect afternoon’s adventuring. How about taking aim with live arrows on the Castle grounds? You may not have been a marksman at the tender age 10 like Ned Stark, but now is your chance to loose arrows with the ferocity of a Wildling attacking the Wall (well, maybe not THAT hard). And if that’s not enough fantasy adventure, Castle Ward is also home to Odin and Thor. Who are they, you ask? Well, only the Direwolf puppies the Stark family discovered in series one. A meeting with these beautiful animals – they’re not actually wolves but Northern Inuit dogs – is a dream come true for any self-respecting Game of Thrones fan. Did we mention the gorgeous beaches in Northern Ireland? They’re enough to rival any fantasy waterside setting. Take Quintin Bay, which appeared as the beach near Castle Stokeworth in the Crownlands, where Jaime Lannister goes to find Bronn. As dusk descends, perhaps it’s time to end your tour of Winterfell with a surprisingly peaceful walk along the shore of the lough before making your way back to Belfast. You’ve left behind the majestic Castle Ward and now it’s time to start your day at Titanic Belfast. Many of the memorable Game of Thrones interior scenes were shot in the Paint Hall (Titanic Studios) right next door – you can’t actually pop inside as it’s a working studio, but just imagine the goings-on that have been filmed in here: this was the setting for the Throne Room in King’s Landing (home of the Iron Throne), the Sept of Baelor and the interiors of Riverrun and The Twins. Leaving Belfast and its Titanic footprint behind, set your sights further north. Follow the coast road past Carrickfergus Castle and beyond. Then turn west towards the Shillanavogy Valley, your next stop. This was where the ferocious Dothraki hoard set up camp, and the verdant, green valley was seamlessly transformed into the swaying grasslands of Vaes Dothrak. It’s back towards the coast again now. Cairncastle is your destination and we’re right back to the very first episode. It was here that Ned Stark took his long-sword Ice and struck off the head of a Night’s Watch deserter, as John, Bran, Rob and Theon looked on. Most recently, it doubled as Moat Cailin, where Littlefinger took Sansa, while Brienne and Pod look on from a distance. 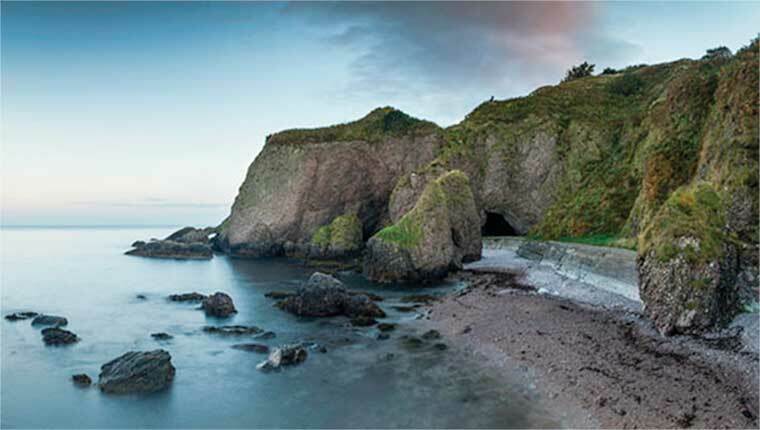 Head north along Antrim’s stunning coastline: the Cushendun Caves are calling. Davos Seaworth acted against his better judgment when he escorted Lady Melisandre on her quest to assassinate Renly Baratheon. The Cushendun Caves were used for the unforgettable scene where Melisandre gave birth to the monstrous “shadow baby” that was Renly’s undoing. If you’re up for it, The Glenariff Forest Park walking trails are a treat: think rivers, riverside walkways and lots of waterfalls. And of course the panoramic views are nothing short of epic, so don’t forget your camera. And so the day is done. All that’s left to do is to find a good inn for the night and treat yourself to a hearty flagon of mead. Or a local Antrim beer. Your choice. The coastal town of Cushendun is the perfect place to rest up and prepare for day three. We travel from Cushendun to the very top of the island now and into Ballycastle. This small seaside town makes an ideal base from which to explore several Game of Thrones™ settings. First up, Ballintoy Harbour. This sleepy little port was transformed into the rugged Iron Islands for Theon’s homecoming scene. Most recently, it’s where Lady Melisandre was back to doing what she does best: playing with fire. Her unfortunate victim in season four was Stannis’s brother-in-law, Lord Florent. Slightly east from here is Murlough Bay: the setting for Theon’s unconventional horseback ride with his sister Yara, and the scene where Davos is rescued after the Battle of Blackwater. It’s also the Coast of Essos, where Tyrion and Jorah come ashore on Slavers’ Bay. A quick trip back to Ballycastle for lunch and then it’s off to one of Northern Ireland’s iconic sites: the Dark Hedges, an atmospheric avenue of beech trees (complete with resident ghost, according to the locals). This stretch of road was used to depict the Kingsroad, which was usually plagued by bandits and thieves. Thankfully, it’s quite safe in real life, so take your time and take lots of pictures. It’s a magical spot. This brings you from Ballycastle to the ancestral seat of House Targaryen: Dragonstone. Downhill Strand in County Derry-Londonderry is famous for its seven-mile stretch of golden sands. With the iconic Mussenden Temple in the background, Downhill was used for the scene where Lady Melisandre burned the seven gods of Westeros in sacrifice to R’hllor. Portstewart Strand is another of Northern Ireland’s glorious beaches, and it’s where Jaime and Bronn, disguised as Martell soldiers, approach the gates of the Water Gardens. In the words of Jon Snow, “different roads sometimes lead to the same castle.” In this case, they do: via a private 150-mile round-trip guided car tour. Get whisked away on four wheels to the frozen North of Westeros and admire Dunluce Castle, walk the spooky Dark Hedges and get sea-sprayed at the coastal nook of Ballintoy Harbour where Theon landed on his return to the Iron Islands. Round it all off at the jaw-dropping Giant’s Causeway, another iconic location of myth and magic in Northern Ireland. 40,0000 perfect basalt columns created by a giant? In the land of Westeros, anything is possible. 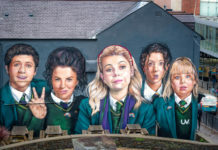 Travelling by car isn’t your only option: How about travelling on the very same bus that chauffeurs the Game of Thrones actors to all the epic filming locations in Northern Ireland? McCombs Tours has worked on every season of Game of Thrones since the beginning, so you’ll be in expert hands. 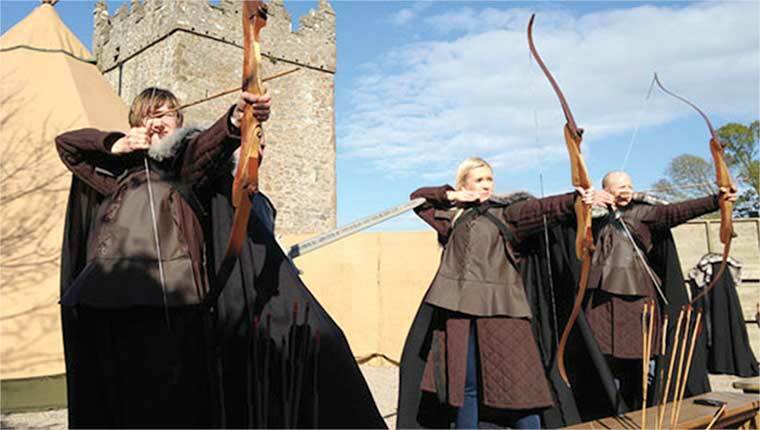 Or, get your own private tour with Winterfell Tours and see all the sights in ultimate style. 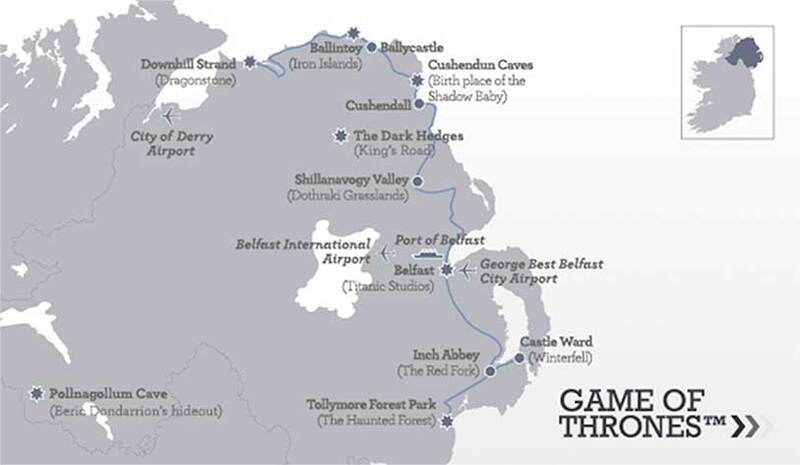 And it’s not just them: Tour of Thrones NI will have you walking Winterfell and braving the Stormlands. Stones and Thrones offers a double-whammy trip of a Game of Thrones and Giant’s Causeway Tour, while Belfast Sightseeing Tours will have you snapping pictures of all your favourite Game of Thrones locations. And for a luxurious coach trip around iconic locations such as Ballintoy Harbour and The Dark Hedges, look no further than Translink. All you have to do is sit back and relax! You can even combine both driving AND walking with a location trek. Game of Thrones Tours offer coach tours from both Dublin and Belfast. Once you’ve driven to these awesome locations, hop out and experience them first-hand on foot! So ends our epic quest into the real world Westeros. By car, coach or taxi, we’ve journeyed from one end of the Seven Kingdoms to the other. But if you’re still eager to continue the Game of Thrones saga, grab your sword and get ready for plenty more action. HBO®, Game of Thrones®, and related service marks are property of Home Box Office, Inc. Used under license. This itinerary is not sponsored, endorsed or affiliated with HBO or anyone associated with ‘Game of Thrones’. Previous articleTraditional music is a household name in Ireland.